Many in Asia had expected to see a recovery today following the turnaround we saw in US markets, but this was not to be. 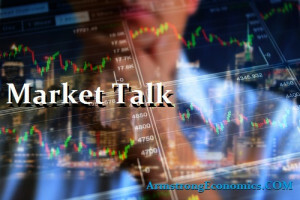 Despite an early rally prices soon turned lower as concerns over the US/China trade tariffs and renewed Yuan negativity. The Hang Seng looked to be the outlier but remember it was closed yesterday. Core Shanghai looked as though it could be serious just ahead of lunch but managed a recovery and even closed positive on the day. The Nikkei and Yen played off-set for much of the day, but is late US trading we are seeing a renewed run for the currency as the DOW losses go into triple figures. The SENSEX was bid and managed a +0.3% gain but the currency remains a threat as it toils with the 69 handle yet again. So far, the high has been 68.80 but the bearish trend remains so expect that to go soon. Main headlines are claiming that Angela Merkel saved the day for Europe by agreeing the coalition flexibility. Subsequently, all core Europe closed around +0.75% firmer on the news with the Euro even managing to bounce a touch. The main issue remains the migration issue, but US trade tensions and the auto sector really cannot escape that line of reasoning. The late US sell-off will have an impact in tomorrows trading especially as we have holidays in the US markets. Gold has seen a bounce today having been badly hit the past week. Oil did hit $75 but has also backed-off over a continued foggy outlook. In a holiday shortened US trading day, we saw early gains rejected as industrials and technology feel heavy selling pressure. News today that the DOJ is investigating Glencore and that is hitting the stock (-8%) and is weighing on both commodity markets and sentiment. There are still far too many variables to cover the fundamentals of all this so just follow the money. It will be interesting to see the jobs number on Friday, but with estimates of around 200k anything south of this may push stocks once again. Japan 0.02%, US 2’s closed 2.53% (-2bp), 10’s 2.83% (-4bp), 30’s 2.96% (-3bp), Bunds 0.29% (-1bp), France 0.63% (-3bp), Italy 2.63% (-1bp), Greece 3.90% (-1bp), Turkey 16.69% (+50bp), Portugal 1.72% (-3bp), Spain 1.28% (-1bp) and Gilts 1.24% (-1bp).